Bissell is Helping us Get Somebody a New Handvac fur FREE! Notice that I'm in the ad. Not bad, huh? What's even better is that mom is giving away one of these great pet fur erasers over at All Things Dog Blog. You can enter by following the instructions in her post. It's a great holiday gift for any mom, dad or dog-lover on your gift list. Mom says it works really well on our fur in the car. 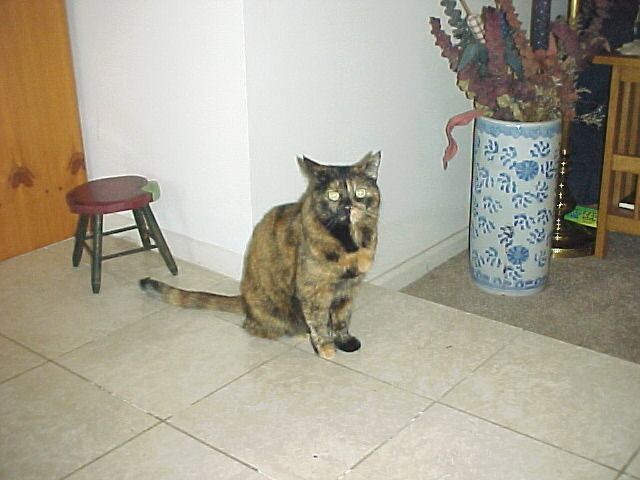 That was her first complaint about our old vacuum. It was nice to see her smiling while she was vacuuming up my fur. BOL!!! While Tanner is off running with Dad, I've got editorial duty. Mom's busy passing along tips for saving money on us pups. That's important cuz the more money you have the more pups you can have, right? When you subscribe to All Things Dog Blog, mom sends you a free ebook called Putting Your Dog on a Budget. Sounds like a 'no toys' kind of thing to me, but she assures me it's not. Whew! Over at All Things Dog Blog, mom has coupons, discounts and all sorts of ideas for saving money, in addition to the ebook. You should probly check 'em out. It's good stuff. Things are just completely out of hand here. After the MANKINDdog business, and then the Woof and Meow series, we thought we'd get a little vacation. Mom's got us doing more photo ops for toy and vacuum reviews and all sorts of other stuff. Does she think we're cover models or something? Next thing you know, she may be training us for Chippendale dancing. Hmmmm.....That could be a clever theme for a Canine Freestyle routine, huh? We'll have to put that on our long term To Do list. 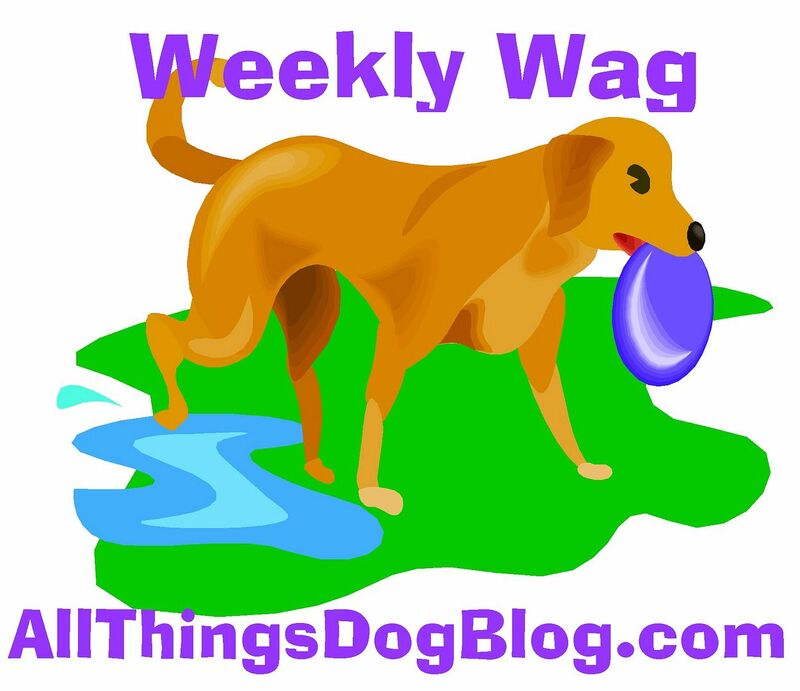 For now, we just want to remind you to check out the vacuum giveaway that mom's got going at All Things Dog Blog. It's a dandy! Mom is so funny. She mentioned something about starting to review dog books on her blog, All Things Dog Blog. I told her I'd be happy to help with that. Just toss it over and I'll gobble it down. She laughed at me! Seriously, what's not good about eating paper? All dogs love the stuff. There's nothing better than a box of tissues, right? I just don't get my mom sometimes. She says she'll be either doing the book reviews herself or getting another writer to contribute them. Any takers? 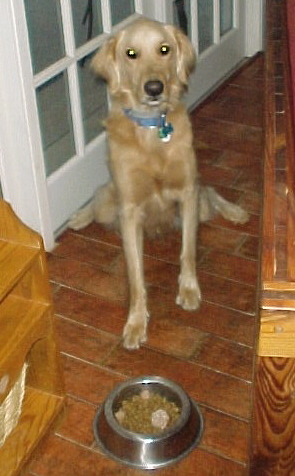 Our mom is sharing her tips for bringing a new dog into the house, over at All Things Dog Blog. Both of us--Tanner and Oliver--came into our home after Patches was already full grown. Technically she was already considered a senior cat. She's 12 now. Mom was patient with us while we learned how to behave the right way with Patches. Of course, I picked this up much quicker than Oliver ;) Mom says that's because I'm so big that I knew I had to be more gentle around her. I think I'm just smarter than Oliver, but don't tell him that. He's sorta touchy about that stuff. It's a little dog thing. Oliver still has his moments. He'd like to get her to play with him, because she's about his size. They would be nice tag partners. Patches doesn't think so though, and a couple of times when Oliver was still a pup, he got his nose swatted. That helped him to learn the ropes. Now his efforts at getting her to play tag are merely invitations, without too much energy behind them. He's finally smartened up and realized he likes his nose on his face. I'm glad cuz I don't think I'd enjoy looking at a dog without a nose all day. Occasionally Patches will join us all on Mom's bed, when we watch a movie or take a nap. Her back is always to us and of course, the minute mom grabs her camera, Patches scoots. She's really camera shy. Oh well. Oliver and I make better photo models for a dog blog anyway, right? I'd like to add some notes about treats for well-behaved dogs. I think mom missed that point. We'll have to have a talk about that. I'm finally done with my big job. This week my mom had me guarding the New Dog Kit that she gave away today. It was big work for a little guy. I had to keep all the gifts safe from the big Mastiff down the street, and the Doberman that lives around the corner. Whew! Today our Mom awarded the kit to a Facebook Fan. The winner's name is in the post at All Things Dog Blog. Was it you? I hope the puppy is very happy and he gets lots of long walks. I'm pooped now from all this guard duty. Time to nap. My mom and a dog loving company called MANKINDdog™ have formed a pack of their own. They're busy raising money for mom's favorite rescue and MANKINDdog's local Humane Society by getting bloggers to link to their program. At the Blogpaws conference lots of pet bloggers like us started a "Be the Change" program to do good stuff for pets. They're helping mom out too, with a nice post at the link above. When we all work together, we can help lots more pets get homes and have nice lives. Tanner and I want to do our part, cuz we're the lucky guys. So, we're going to "Be the Change" along with our mom. Won't you join us and blog about her campaign! When it's all over they'll be giving away lots of thank you gifts and 2 big prize packages. Tanner and I looked over the prize packages and decided we're in. We're bloggers too, so we're going to help out. We're posting about the campaign right here. 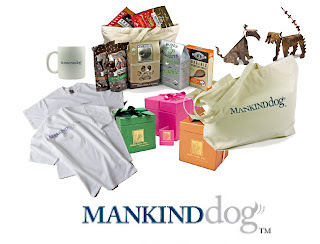 Order $40 or more of merchandise from MANKINDdog™ by November 19 to enter. Then, let my mom know you entered to be sure your name is in the pot. (That's really, really important!) Send her a message or email her at LetsAdoptaDogPark@gmail.com. On November 20th, MANKINDdog™ and All Things Dog Blog™ will announce the winners. Here's the prize package: You can read more at mom's post. Just follow the link above. There's a New Dog Trainer in Town: I've Got to Be on My Toes Now! Did you hear the news? 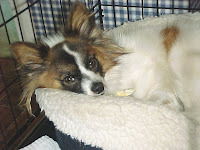 My CGC tester guy is now a staff-member of my mom's blog. I guess that means I have to be a perfect angel now. I'm not sure this CGC stuff is everything it's cracked up to be. I have all this pressure on me now. Every time we leave the house I have to be a good boy. What fun is that? I suppose I'll just have to do my best to keep my nose clean. It would get worse if I'm naughty and mom took me back to get MORE training. I mean, really....he's a nice guy and all. But I'd rather go to the dog park than school. Wouldn't you? Did I Lose My Job? Nah! JK...I've been busy with Tanner taking pics of us in our new MANKINDdog™ bandanas, so I guess that why Scruffy got the SpokesDog job in the post about Seniors and Puppies. It's okay, we look extremely dapper in our new bandanas and you'll get to see us soon. 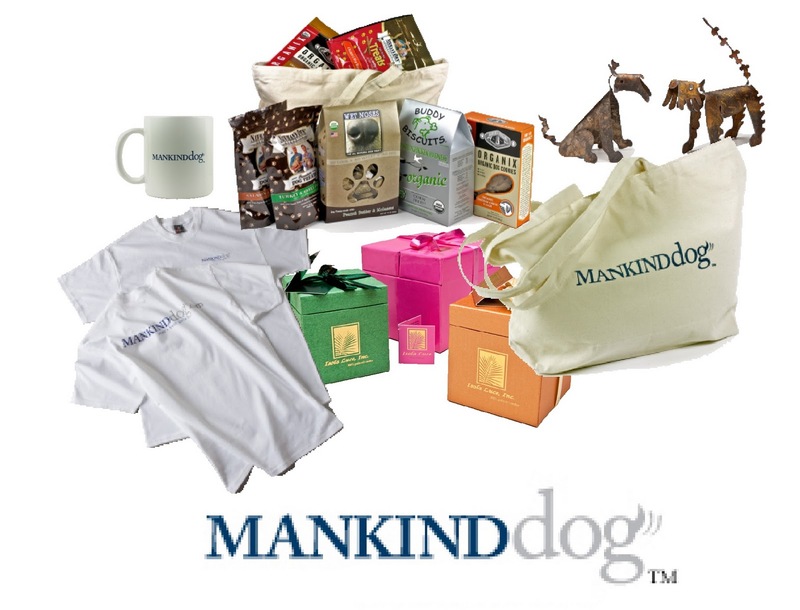 Have you seen the prize package of MANKINDdog™ goodies that mom is giving out at their raffle? Wow! Somebody is going to be super lucky to get all those great gifts. Mom says there's only 2 weeks to enter, so you better get going and find out how at her post. Good luck! Today is a great day to remember your canine companions' loyalty and dedication to you. Hasn't he kept your feet warm in bed, guarded your home and made sure you get your exercise. Of course! Now it's time to return the favor. 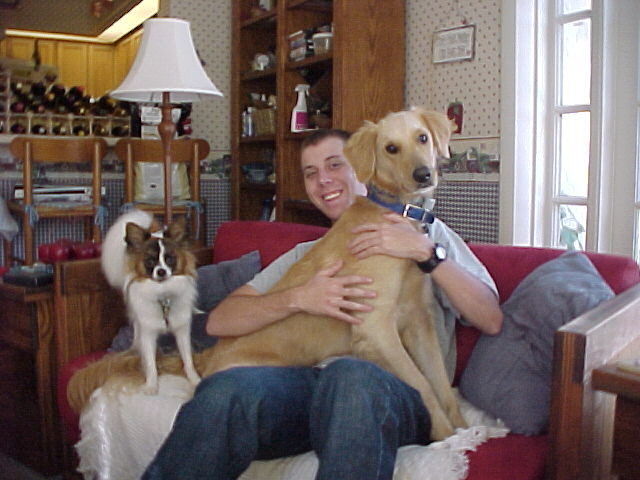 Our mom is busy as a bee at All Things Dog Blog™, telling the whole world about MANKINDdog™. This is a cool website that carries really super nice stuff for dogs and dog owners. Maybe you'd like to take a look? Mom and the MANKINDdog™ folks even got a big charity campaign going to help the 257 Labs at our local rescue and a Humane Society in Arizona. She says they are trying to Be the Change for Animals. This sounds good to us. There's a group of pet bloggers that have banded together to network and do good stuff for animals. 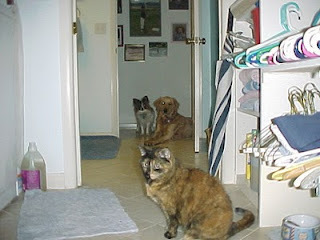 They all get together to share ideas and help out rescues through the Blogpaws site. They even have conferences to talk about pet blogging. Mom went to one of their conferences a couple of months ago and now she's a blogging lunatic. Well, maybe that's a little harsh, but you get what we mean. Apparently us bloggers really can make a difference. Who knew?!! We hope you'll check out the cool prizes and fun doggie stuff at MANKINDdog™ and the program at All Things Dog Blog™. See ya soon!